Robocall pollution has made people far less likely to pick up the phone when an unknown number comes up. It’s hard to know exactly how many unwanted calls are out there, but estimates put the number at 100 billion for known scammers and another 30 billion in nuisance calls. As people wait for the government or carriers to solve the problem, some companies have stepped in to provide solutions to consumers — through apps — or businesses. This week First Orion, a call protection company, launched a new product to address the problem. 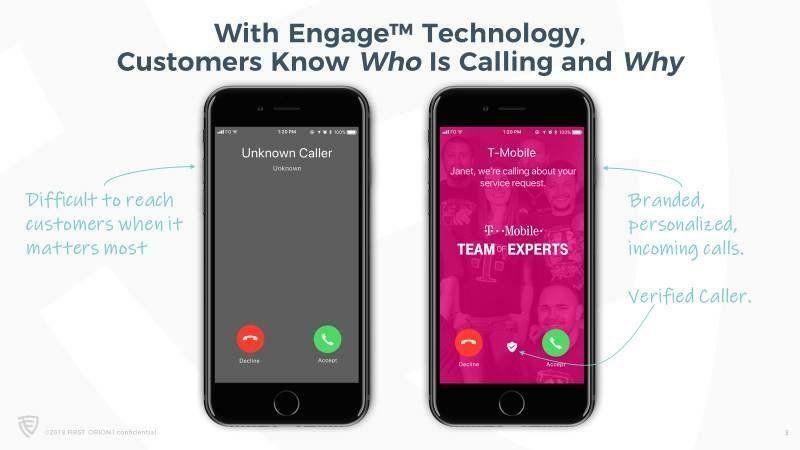 The product, called Engage, will allow companies to effectively “brand” incoming calls so that people actually answer them. For example, when a call comes in with an unknown number, some phones might identify it by location, given an area code. But with the rise of neighborhood spoofing, this practice is essentially meaningless, and less useful if a business uses an 800 number. First Orion estimates that businesses make 8 billion legitimate calls per month, mostly concentrated in financials, services, telecom, and retail. These are wanted calls that deliver useful information to customers, and due to the horrible volume in unwanted robocalls may go unanswered and straight to voicemail. So far, only T-Mobile has been announced as a company that has been testing this technology, but according to First Orion, more are coming soon. So far, the answer rates for legitimate calls have doubled.